I've got a question about recycling rechargable batteries that go into electric cars. Which kinds of batteries are better for the environment, considering recycling, waste, and stuff like that? I wrote an article recently called recycling lead acid batteries, and discovered in the process of doing research for that article that the rechargable lead batteries that go in our cars are going overseas to be disassembled by child labor in unsafe conditions. Blech. 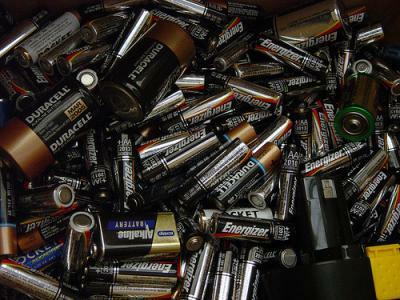 Apparently, it's cheaper to send our old toxic batteries to developing nations than to recycle them here, even though this practice is illegal! A better way: There is a company called Toxco that recycles batteries of all sizes and chemistries at their facility in British Columbia. They have a program called "Big Green Box" for recycling all rechargable batteries for a flat fee; just buy the box from them, and they pay for the shipping. Which battery is best for the environment? They're all toxic, one way or another. Our challenge is to use (and recycle) them responsibly! My feeling is that our government could be doing more to keep corporations from shipping our battery waste to other countries, and they should be held accountable. I'd have to go with LiFePO4 as the most responsible EV battery at the moment. The way lithium is "mined" is pretty eco friendly and human friendly. I recently saw a NPR story on electric cars which talked about lithium mining. When you go to the link, click on the audio to hear an interview with Seth Fletcher on his new book called Bottled Lightning: Superbatteries, Electric Cars, and the New Lithium Economy . He talks about how lithium production is a process of gathering and sun-drying lithium salts - basically pretty harmless - to concentrate them.